All transactions are safe and secure with a reliable history in online purchasing behind each of our associates. 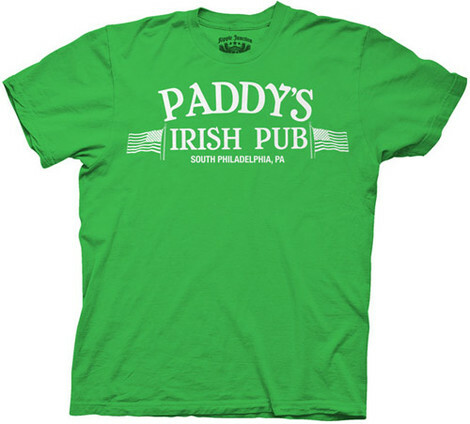 Buy the Paddy's Irish Pub t-shirt to own It's Always Sunny in Philadelphia clothing and merchandise. Paddy's Irish Pub in South Philadelphia...the infamous watering hole of the Sunny gang. While it is near and dear to the co-owners hearts, it's not for everyone. After being labeled the worst bar in Philadelphia by a newspaper critic, the pub has a long way to go to become the best. Stop down, chug a few pints and help them get back on their feet. Grab a Paddy's Pub t-shirt to promote! In addition to the Paddy's Irish Pub tee above, browse the It's Always Sunny in Philadelphia Clothing Gallery for more apparel like men's and women's clothes, kids shirts or hoodies.